When it comes to speciality drinks, the only limit is your imagination! You can invent your own recipes or take inspiration from magazines, TV programmes or recipe books. 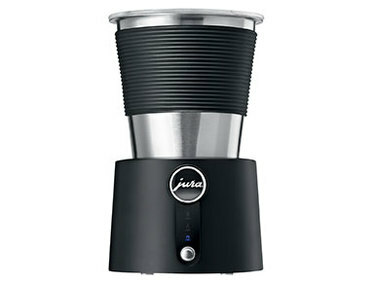 From latte macchiato and hot or cold chocolate to popular specialities like frappés and chai latte, the JURA Milk Frother helps you create perfect results every time. A quiet electric motor drives the attachment in the milk container without coming into direct contact with it. In next to no time, this attachment makes perfect fine milk foam, either cold, warm or hot depending on preference. If only hot milk is required, a second attachment prevents the milk from burning. To select cold, warm or hot milk foam, all you have to do is press the ergonomic button once, twice or three times. The self-explanatory pictograms indicate the selected mode. The frother is also very easy to clean: the magnetic drive allows the pitcher to be immersed in water and rinsed out. The supply cable and attachments fit easily into the bottom of the base unit, allowing the Milk Frother to be conveniently stored along with all its accessories.